I know yo uhow you guys like free Silhouette cut files so today I'm so excited to share not only a free set with you - but a fun (and free) way to use them! 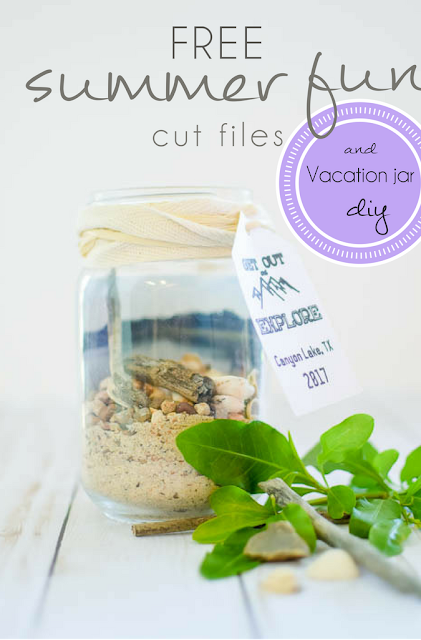 Silhouette School contributor Cat over at Pocketful of Posies is here today to share this little tutorial on making a Vacation Memory Jar Project and offer you a full set of summer fun cut files! We recently had the wonderful opportunity to take a little break from the hustle and bustle of everyday life for a few days up at the lake. For our daughter's first time camping, we wanted to find a way to make a special memory jar for our family trip....so we collected sand, rocks, clam shells, and twigs from the beach. Once we got home I boiled a pot of water and dumped everything in and let it sit for about 2-3 minutes. This killed anything that might cause it to mold or get stinky. Then I lined a cookie sheet with foil and baked everything at 350 for about 10 minutes. Stirring and moving things around every 2-3 minutes until everything was completely dry. I used one of my Summer Fun Cut Files and the standard tag cut file that was already included in my Silhouette Library. Once I had everything arranged just the way I wanted I set my Tag to "No Cut" removed my Silhouette Blade and inserted my Scrapbook Marker and Silhouette Pen holder. (Sorry Silhouette, but I prefer to use these Scrapbook Markers since my Silhouette Pens dried out immediately.) After changing my Settings to "Silhouette Sketch Pens" I sent my design to my Silhouette Machine. When it's done sketching do not remove the mat from the Silhouette CAMEO...you still need to cut out the tag! Next I switched out my Pen Holder and Scrapbook Marker for my blade. Changed my Summer Fun Cut File to "No Cut" and my Tag to "Cut". Then I changed the setting to "Card Stock" with the settings Blade Depth: 3, Thickness: 20, Speed: 4 and sent my Design through my Silhouette. To assemble my Vacation Memory Jar I first wiped it down with rubbing alcohol to make sure it was really clean then I simply filled the jar with all my sand and other goodies, being sure to leave some of my shells out to place them on top. Then I trimmed my photo, which I printed on HP photo paper, down to size and slid it in behind all of beach goodies. Next I wrapped the Top with twine and tied my Summer Fun Tag in place.